I recreated one of my favorite board games that I’ve had for 25+ years, Cathedral. 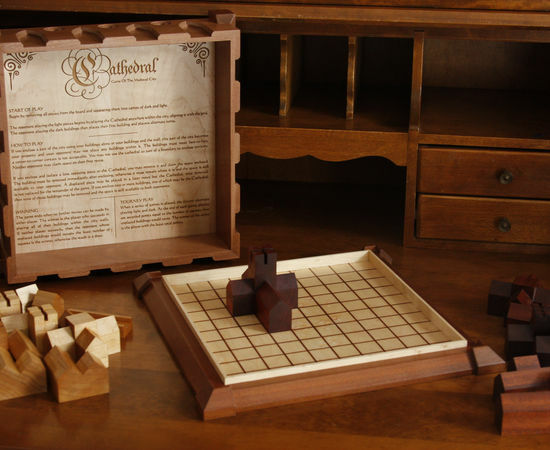 The original board was just printed MDF and the pieces were made of cheap pine blocks glued together and stained their respective colors. I wanted to make a much nicer version with each piece carved from a solid block of contrasting woods. The board and pieces were done by hand prior to getting my Shapeoko but the lid relied heavily on it. I actually think my obsession with getting this made is 80% of the reason I bought a CNC, but I’ve got more than plenty of uses for it now! Oh, if anyone is interested, here’s a bit more of build album. Really nice, I especially like the top with the vcarving through multiple veneer layers to create the text with a 2 part outline. Thanks! That came about during a conversation with a very artistic friend of mine and I’m really happy with how it came out. Now I want to play with different wood combinations and “line weights” by varying the thickness of the middle veneer. Have you ever considered getting a Jointmaker Pro for your handwork? I had never heard of it until now so I checked out a video. Those look really cool and I can think of a ton of uses but then I noticed it’s from Bridge City Toolworks. I didn’t see a price but I know I can’t afford it. $1585.00 for the Pro model. What a cool idea. You could just make a simple jig and let people run a regular block plane over it for a group activity. Nice! I remember a long time ago you (?) posted a picture of “Cathedral” vcarved… That was you, right? Yep, that was me, it wasn’t even the only post about this project! I’ve been working on this and trying to learn my CNC for a while now. With a lot of help from this forum, I think I finally got it right. Very nice. My brother has this game and I’ve played it a few times. It’s been years and I had forgotten about it. Thanks for sharing!